Say goodbye to pimples and shine with the Pulpe de Vie Organic Anti-Blemish Face Mask ! This express treatment brings you a purifying shot in one application. Its flagship ingredient, organic tomato water, has astringent and sanitizing properties. It matifies your skin while tightening the pores. Also rich in citrus, it unifies the complexion and refines the skin texture. Thanks to the fucocert complex, your skin is perfectly hydrated. Even oily skin needs hydration! Composed of bioecolia, natural prebiotic, this biological care acts in depth by stabilizing the cutaneous flora. Made of organic cotton, it respects the skin and offers a real moment of softness. 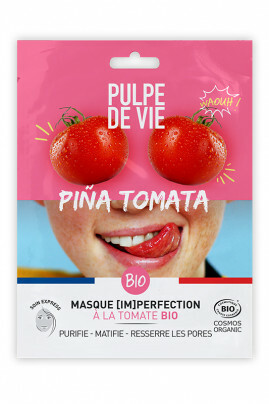 This Pulpe de Vie Organic Anti-Blemish Face Mask is perfect for combination oily to oily skin. To adopt urgently in his beauty routine against pimples! Beforehand, we advise you to perform a gentle exfoliation such as Pulpe de Vie Sucré Frappé for a better penetration of the assets. Unfold the mask in biodegradable fabric and gently place it on your face by orienting it correctly with respect to the planned openings. Let stand between 10 to 15 minutes. Remove the mask and massage the excess serum with your fingertips or rinse directly with clear water! Here you are with a fresh and purified skin! A face mask with anti-imperfection properties and biological composition!